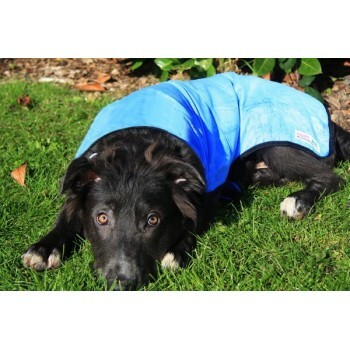 Easidri’s super absorbent Cooling Coat has a unique cell structure which slowly releases its moisture without wetting your pet’s fur. The Cool Coat cools as the water slowly evaporates, cooling your dog as it does so. Use in hot weather to help keep your dog cool and comfortable. Reusable and machine washable, the Easidry Cooling Coat is supplied in a handy resealable bag so it is always ready for use. It is tough, durable and resists tearing and shredding. We stock the coat in sizes XSmall to Medium, and wider fits are also available.